Margaret Roach has left Martha Stewart Living Omnimedia to pursue new projects. She has started up a new blog, also. Margaret was the former Chief Editorial Director of MSLO and was a cohost of the gardening show on Martha Stewart Living Radio on Sirius Satellite. She also headed up the web division. She was part of the top-notch executive team at MSLO, which was named the best in the country by Ad Week last year. She was also responsible for bringing us the timeless, 'evergreen' content to the pages of all of the Martha Stewart Living publications. 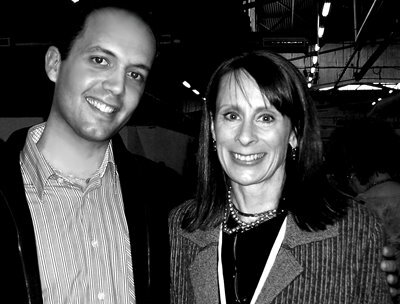 She began at the company in 1993 as the gardening editor for the magazine and was the editor-in-chief ten years later. Her position as Editorial Director at MSLO is currently being filled by Kevin Sharkey, Lucinda Scala Quinn and Hanah Milman. It takes three people to do what she did single-handedly, something I think speaks volumes about her capabilities and expertise as an editor and executive. I've met Margaret on a few occasions: once at the Good Things Event in 2006, and a year earlier at her home in Copake Falls, New York, where she tends to a beautiful, hillside garden that surrounds a small, century-old farmhouse. She has another home in Massachusetts and an apartment in NYC - all garden-friendly! I know her to be a naturalist, a passionate gardener and someone who once described herself as a 'hippie in a glass tower' at MSLO, someone who stuck out a bit as an unapologetic promulgator of unrefined, all-natural landscape design in a company that is very focused on perfecting the art of perfection. I see her return to the garden, and to projects surrounding its beauty, as a natural course of action for her, a sigh of relief and a new start after fifteen years with the company. Thank you for the update Andrew - it's nice to know someone has the "inside scoop" of the ongoings at MSLO. I thoroughly enjoyed Margaret's articles in MSL - and was secretly hoping she would put out another gardening book, perhaps a "Gardening Handbook" to go along with homekeeping. I'll definitely keep an eye out for her upcoming book! Not sure if you are aware ..
today -- Martha Stewart Framed Photograhpy ....?